PASTIC Sub Center, Quetta organized the training workshop on "Easy way of Library Automation and Digitization" in collaboration with BUITEMS, Quetta from 24-26 May, 2017 at BUITEMS. The objectives of the training workshops were to train librarians to automate and digitize their libraries, to build digital libraries using Calibre software and to boost ICT skills in the librarians of interior Baluchistan. Prof. Dr. Ahsan Ullah Kakar, Civil Engineering Department of BUITEMS was the chief guest. 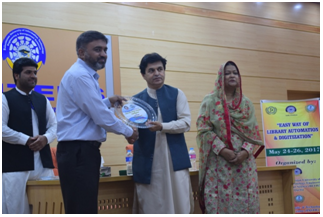 Mr. Syed Habib Akhter Jaffri, Principal Librarian from PASTIC National Centre Islamabad was the resource person of the workshop. Miss. Nageen Ainuddin, Director, PNC, Islamabad, delivered brief introduction of PASTIC Services and vote of thanks. A total of 32 participants attended the workshop.